Countess Markievicz, an Irishwoman born Constance Gore-Booth, made a lifetime out of defying description. A woman of privilege, she worked as a political activist and suffragette. She was at home in ball gowns and in what was then considered men's attire. 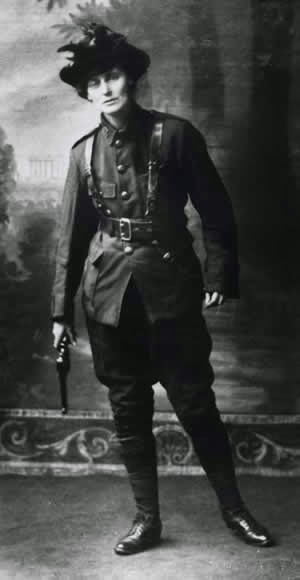 She fought for Irish independence, taking part in the 1916 Easter Rising and held in prison afterward, the only woman held in solitary confinement. She was sentenced to death, but spared the firing squad; after that, she left Ireland, only to be re-arrested on her return. From her jail cell in 1918, she would become the first woman elected to the British House of Commons, though she refused to take her seat. Instead, she helped form a legislature in Ireland, and later became the first female cabinet minister in Europe. The better ideal for women who, whether they like it or not, are living in a work-a-day world, would be – If you want to walk round Ireland, or any other country, dress suitably in short skirts and strong boots, leave your jewels and gold wands in the bank, and buy a revolver. Don’t trust to your ‘feminine charm’ and your capacity for getting on the soft side of men, but take up your responsibilities and be prepared to go your own way depending for safety on your own courage, your own truth and your own common sense, and not on the problematic chivalry of the men you may meet on the way…. A consciousness of their own dignity and worth should be encouraged in women. They should be urged to get away from wrong ideals and false standards of womanhood, to escape from their domestic ruts, their feminine pens...We have got to get rid of the last vestige of the Harem before woman is free as our dream of the future would have her…. This speech also was picked out by current Sinn Féin vice president and Dublin Central TD Mary Lou McDonald as her favorite speech. What can you learn from this famous speech? Mix high ideals with a realistic call to action: In 1909, votes for women and Irish independence were seen as ideals that would be difficult, if not impossible, to achieve. So Markievicz called on her women listeners to try things that they could imagine themselves doing. To the modern ear, her call for dressing in short skirts and carrying a revolver may sound reactionary--it's certainly the most frequently quoted part of the speech--but it was something that could be achieved. As you can see in the photo, she wasn't afraid to take her own advice. Hitch your wagon to a star: Markievicz made it clear in this speech, over and over again, that an independent Ireland without independent women would not do. In talking about the decorative woman versus the active one, she makes the case for a less passive and more activist approach to indpendence for the nation as well. It's a clever approach. In speaking to women's groups on this score, she was perhaps suggesting to any male listeners that women might have an objection if there were independence for the nation, but not for themselves, thus losing a source of votes for the cause. And to women, it suggested that independence for Ireland only really worked if they, too, were independent. As we say today, a win-win. Give your audience courage: I sometimes think that few speakers realize that encouragement, or the giving of courage, to an audience can be a powerful tactic, something different from a simple call to action. Much of this speech involves encouragement for the young women she was addressing, helping them to envision themselves active in politics and in running the nation. You might try that in your next speech. The full text of this speech can be found in In Their Own Voice: Women and Irish Nationalism . Countess Markievicz School, an annual conference in Dublin, helps keep her public speaking tradition alive today, with an annual lecture in her name and training to encourage women more actively in politics. I'm especially pleased that each "school," once completed, includes a web archive of all the speeches given, with links to video--an important archive of women's speeches.